Home » What is HVAC? HVAC systems are used in both commercial and residential establishments. They play a vital role in ensuring that the climate within the structure is comfortable and that stale air is replaced with fresh air from outside. Heating, ventilation, and air-conditioning are all interrelated, especially when thermal comfort and indoor air quality need to be provided within reasonable costs for installation, operation, and maintenance. HVAC systems can increase ventilation, reduce unwanted air infiltration, and even maintain relative pressures between spaces within an establishment. Removing air from an enclosed space and replacing it through air delivery systems is known as Room Air Distribution. In modern buildings, one or more HVAC systems are incorporated in the building’s design, along with control systems for manipulating their performance. For small buildings or residences, contractors usually estimate the required capacity based on the interior dimensions, and then select and incorporate the HVAC system accordingly. Larger buildings, however, are thoroughly analyzed by building service designers or engineers who then specify the appropriate configuration of the HVAC systems needed, which are fabricated by specialty mechanical contractors. Buildings of all sizes must clear code-compliance inspections and obtain relevant building permits. The heating system generates and distributes heat to the entire area covered by the HVAC. Heat generation can be achieved with boilers, furnaces, or heat pumps that circulate hot water, steam, or directly heat the air in a central location, like furnace rooms in houses or mechanical rooms in larger buildings. The heat is transferred by radiation, conduction, or convection. Generation – There is a wide range of heaters available, powered by a variety of solid, liquid, and gaseous fuels. Another popular power-source is electricity, which is typically used to heat ribbons of high-resistance wire in baseboard and portable heaters. One of the most efficient ways of generating heat is to use heat pumps. They extract waste heat from exhausts, or even free heat from the ground or the environment, and circulate it through the building. Electric heaters are typically installed as a backup for heat pumps or to provide supplemental heat. With recent improvements in efficiency and low-temperature operation, heat pump HVAC systems are steadily gaining popularity in all climates. Water/Steam – Water can be heated and circulated in liquid form, or if there is enough heat converted to steam. A pump and system of pipes is used to transport the heated medium and the heat is transferred to the air using heat exchangers like radiators and hot water hydro-air coils. These can be wall-mounted or installed within the floors. Using water to transfer heat is known as hydronics. An additional advantage is the hot water can be used for bathing and washing too. Air – Warm air systems use a system of ducts to distribute heat. The warmer air is delivered and cooler air is returned to the heating system. Many systems can also use the same ducts for delivering cooler air from an air-conditioning system. Typically, a filtration or air cleaning system is installed within the ducting to remove pollen and dust particles. Dangers – Wherever there is fuel being burnt, there is always a chance of incomplete combustion that can result in the formation of Volatile Organic Compounds (VOCs), formaldehyde, carbon monoxide, and other dangerous substances. The dangers they pose at even low concentrations are well documented, so adequate ventilation must be provided. Mechanical or Forced Ventilation – Air handlers that mechanically push or force air to move provide this type of ventilation. Kitchens and bathrooms usually have mechanical exhausts that remove odors and sometimes excess moisture from the air. Some factors need to be considered to determine the size and speed of the fan like the size of the room, flow rate, and noise levels. Direct drive fans can be used in many applications and thus reduce maintenance costs and frequency. Ceiling, table, floor, and wall-mounted fans are preferred for circulating air within a room to reduce the perceived temperature. Since heat naturally rises, running ceiling fans during the colder months can keep a room warmer. Natural Ventilation – Air can also be circulated and vented without the use of fans or any other mechanical devices. Natural ventilation can be achieved using a combination of operable windows and louvers. In smaller spaces, trickle vents can be installed if the architecture permits it. There are quite a few systems that use different methods to achieve natural ventilation, like stack-effect ventilation and air-side economizers.In any natural ventilation system, the air change rate needs to be monitored and mechanical systems can be used to supplement the ventilation if needed. This is basically hourly volume of air vented divided by the entire volume of the enclosed space. An air change rate of four changes per hour is usually the most comfortable for humans, but this might need to be higher or lower depending on the number of people, external temperature and humidity, odor levels, etc. Air conditioning systems are used to reduce the temperature and control the humidity of the air being circulated. Most of the air is recirculated, but fresh air from outside is also drawn in, creating positive pressure in the space. All the air being moved is passed over a heat exchanger, which is mechanically cooled, and then circulated to the areas that need it. Both air conditioning and refrigeration are achieved by removing the heat through radiation, conduction, or convection. The mediums used to conduct the heat are called refrigerants, which are circulated through a refrigeration system or a free cooling system. The refrigerant starts in a gaseous state and is pressurized by a compressor, which increases its temperature. It enters a condenser that cools it to liquid state, usually by blowing cool air over it. An expansion valve is used to regulate the flow of the liquefied refrigerant. The cooled liquid is released into another heat exchanger where it depressurizes. When the refrigerant is depressurized, it absorbs energy from its surroundings in the form of heat. This rapidly cools the heat exchanger and the air being circulated through it. Some systems have a ‘reversing valve’ that converts the cooling heat exchanger into a heat source so it can be used to increase the indoor air temperature. Systems that operate on the principles of free cooling are extremely efficient. They are often combined with storage mediums that can capture the higher or lower temperatures in various seasons and release them in the months they are needed. Common storage mediums used for free cooling systems include deep aquifers and even underground rocks that are accessed using boreholes equipped with heat exchangers. Some hybrid systems use free cooling when the required temperature is close to the outside temperature, and a heat pump is used to chill the circulated air further if needed. The free cooling storage functions like a heat sink during summers and can be used as a heat source in winters. Many HVAC systems include an ‘economizer mode’ which manipulates external vents automatically. When the temperature outside the enclosed system is lower and the air inside needs to be cooled, the vents can be partially or completely opened to enable free cooling. This can dramatically reduce air conditioning costs for spaces that generate a lot of heat. Central systems that consist of the condenser, compressor, & evaporator packaged into a single unit are often used in modern buildings, but they are bulky and difficult to install if they weren’t part of the initial design. In most residential buildings, the alternate ‘split’ systems are more popular. The evaporator & condenser are connected using thermally insulated piping, which makes them a lot more flexible. The condenser can be installed in a convenient location where the heat being vented won’t be a concern and multiple evaporators can be installed in different areas. Dehumidification is the process of removing moisture from the air, which is achieved by the evaporator. The temperature of the evaporator’s heat exchanger is much lower than the dew point, so as air passes over it the moisture condenses on the surface and flows into a collection plan. Dehumidifiers are like air conditioners, but their primary objective is to remove moisture instead of cooling. Humidifiers do just the opposite by heating water and circulating air around it. The water then evaporates and increases the humidity. 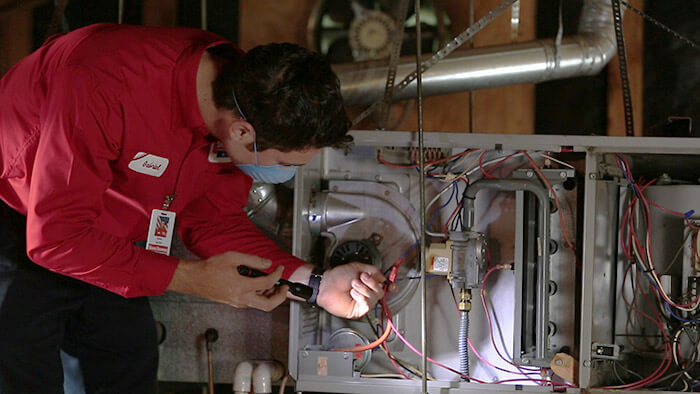 Every type of HVAC system will require some form of maintenance at some point in its serviceable life. The most frequently needed maintenance is cleaning and replacing the air filters, since they are constantly filtering out particles and eventually get clogged, which can reduce the efficiency of the system tremendously. If the circulation is inadequate, it can cause the evaporator coils to ‘ice-up’, which reduces the airflow even further. This can be extremely dangerous since electronic parts can overheat and cause a fire. In addition to replacing the air filters, the condensing coils should also be cleaned periodically. They help dissipate heat from the motor that drives the compressor. Overheating reduces the life of the motor, leading to hefty repair bills. HVAC equipment manufacturers invest heavily in research and development to increase the efficiency of their systems, so there is a huge range of systems and methods that can reduce operating costs and environmental impact. The drawback for many people is the higher installation cost, but the savings in the long run are usually worth it. Using zoned heating can increase the energy efficiency of central heating systems. Multiple thermostats are installed to control the temperature in different zones, allowing for a more granular heating, like non-central heating systems. Zone valves or dampers are used to control the flow of the heat medium to each zone and selectively block airflow, which makes the control system critical for maintaining the right temperature. Below the surface of the Earth, the temperature remains almost constant throughout the year. Geothermal heat pumps use this natural system to provide cooling, heating, and in many cases hot water. The temperature varies with latitude, but at a depth of just 6 feet it remains between 45 to 75 °F. Air cleaning and filtration are important parts of maintaining the indoor environment because the air filters remove particles that can affect our lungs like dust, contaminants, spores, vapors, and gases. The filtered air is then heated or cooled, mixed with fresh air, and then circulated. Cleaning and filtration should always be taken into account when designing an HVAC system. CADR is the volume of clean and filtered air a system provides in a room, relative to the size of the room. When it comes to indoor air quality, filter performance is extremely important. This is affected by the size of the fiber or particles used in the filter, the packaging density of the filtering medium, and the rate of airflow through the filter. Ensure all the system components, like AHUs, controls, and exhaust fans can be accessed easily, without ladders, removal of roof tiles, or crawling into tight spaces. Rooftop equipment should be installed where it is easily accessible by stairs instead of a ladder, as well as an adequately sized door for easy ingress and egress. Label all the HVAC system components to improve operations and maintenance with easily legible and weatherproof labels. In the US, HVAC members are generally members of the American Society of Heating, Refrigerating, and Air-Conditioning Engineers (ASHRAE), certified EPA Universal CFC, or locally certified engineers. The ASHRAE is an international society for individuals and organizations involved or interested in HVAC systems. It provides many opportunities for engineers to participate in research and development related activities through its many technical committees. The ASHRAE publishes handbooks that are updated every four years, the most general of which is Fundamentals that includes calculations for estimating heating and cooling requirements. Typical building codes like the Uniform Mechanical Code (UMC) and International Mechanical Code (IMC) do not provide much information regarding HVAC design practices, so design professionals need to consult ASHRAE data for design and care standards. SMACNA, ACGIH, and some technical trade journals can also provide useful reference material. American design standards for HVAC systems are legislated in the IMC and UMC. In some locations, either of the codes can be adopted and amended through legislative processes. The International Association of Plumbing and Mechanical Officials (IAPMO) and the International Code Council (ICC) update these codes on a 3-year cycle for code development. Local building permit departments typically administer the enforcement of these standards. In the US and Canada, the National Air Duct Cleaners Association (NADCA) represents qualified member companies that provide assessment, cleaning, and restoration services for HVAC systems. NADCA also provides certifications for Certified Ventilation Inspectors (CVI), Air Systems Cleaning Specialists (ASCS), and standards for Assessment, Cleaning, and Restoration (ACR).